Published on January 22, 2012 by Wade Shepard Follow me on Twitter here. SAN CRISTOBAL DE LAS CASAS, Mexico- The floor of my apartment in San Cristobal de las Casas became suddenly pliable, it shifted smoothly to the east and west. The things on my counter top vibrated gently. I made for the door and stepped out into the courtyard and waited to see if the earthquake would grow worse. My wife didn’t even notice it. “We’re having an earthquake,” I told her, but she just looked at me like I was insane and continued on with her day. I’ve been through many earthquakes — though never a large one — and I know that when I all of a sudden feel as though I’m on a ship at sea when on land that I’m either drunk or the earth is shifting beneath me. Either the ground feels as if it’s rumbling or it feels as though it’s moving back and forth. To date, I have not yet been in more than minor earthquakes as I’ve traveled. It is my impression that most people in the highlands did not notice the 6.2 magnitude earthquake that struck 50 km off the coast of Chiapas yesterday, January 21, 2011. The quake ruptured 40 miles beneath the surface of the ocean, a depth which did not cause any alarm for an impending tsunami. For people who live and travel through Central America and Mexico, earthquakes are a normal part of existence. 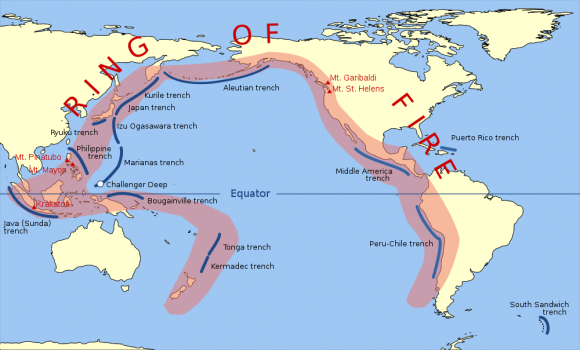 The region is right above the Pacific Ring of Fire, and volcanic eruptions and earthquakes are a regular part of life. A 6.2 magnitude rumble is enough to rattle some windows but not enough to cause alarm. Even on the coast, 50 km from the epicenter, no casualties or injuries have yet been reported. I definitely felt it. I was having lunch in that little place in San Cristobal that has Corona for 15 pesos a bottle. For a minute I was thinking I had one too many Coronas or way too many frijoles. Haha, yes, I thought I was drunk at first too — the room just started moving — haha.